I wrote this book for you if you offer your work as a contribution to others, whatever your work might be. And if now you find yourself feeling exhausted, overwhelmed, and despairing while also experiencing moments of joy, belonging, and increased resolve to do your work. This book describes how we can do our good work with dedication, energy, discipline and joy by consciously choosing a new role for ourselves, that of that of warriors for the human spirit. This book contains maps of how we ended up in a world nobody wants – overtaken by greed, self-interest and oppressive power–the very opposite of what we worked so hard to create. These maps look deeply into the darkness of this time so that we can develop the insight we need to contribute in meaningful ways. 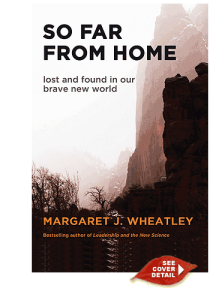 This book provides maps into the future, how we can transform our grief, outrage, and frustration into the skills of insight and compassion, to serve this dark time with bravery, decency and gentleness. As warriors for the human spirit, we discover our right work, work that we know is ours to do no matter what. We engage wholeheartedly, embody values we cherish, let go of outcomes, and carefully attend to relationships. We serve those issues and people we care about, not so much focused on making a difference, as on being a difference. See So Far From Home press release. Visit Berrett-Koehler Publishers’ online catalog. Order from your favorite book seller, online booksellers everywhere, or directly from Berrett-Koehler Publishers‘ at 800-929-2929. Please enjoy this postcard-sized version (approximately 5″ x 7″) of Warriors for the Human Spirit. New: Who Do We Choose to Be?